Reed announces members of the Westside Future Fund board. Since the Atlanta Falcons first unveiled their plans for a new $1.4 million billion dollar stadium, nearby neighborhoods have questioned whether they would see any benefit. 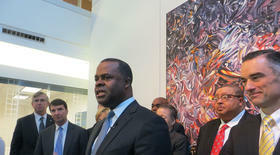 On Friday, Mayor Kasim Reed had an answer. Reed and the Atlanta Committee for Progress appointed members of a new nonprofit board to oversee redevelopment in the Vine City, English Avenue and Castleberry Hill Neighborhoods. When the Georgia Dome was built in the 90s, residents who lived nearby were promised their communities would see revitalization. But most of that redevelopment never took place. Today, the Westside of Atlanta has a lot of vacant and abandoned properties. There’s also significant crime. So when the Falcons deal was announced, residents there wondered if the same thing going to happen again. Mayor Reed says no. Reed’s answer is a 9-member nonprofit board called the Westside Future Fund. He says it will jumpstart redevelopment in those communities. The board is made up of corporate leaders, city council members and the president of Spelman College. Reed says there’s already $30 million from the Arthur M. Blank Family Foundation and Invest Atlanta to start work in the neighborhoods. But there’s worry that investments, especially in real estate, will push current residents out of their communities. Atlanta City Councilmember Ivory Young will serve on the new board. He says keeping that from happening is his top priority. Mayor Reed says any revitalization plan will go before the community. He’s also promising more police and neighborhood protection.